This keyboard connects via bluetooth, is just smaller than a full-sized Apple keyboard, has chicklet keys and works as a stand for your iPad, as well as a case. What differentiates this keyboard from almost all other keyboards is the feature made popular by Apple’s MacBook Pro. This keyboard lights up! Before we get to that, let’s cover the basics. ZAGG did something with the ZAGGkeys PROplus that made me very happy. Instead of it being a plastic chassis made to look like aluminum, this keyboard case is all aluminum. It might add a little weight to it (still lighter than most keyboard cases) but it also makes me feel more solid, more durable and helps it match the Apple look. I absolutely love the aluminum. The keys on this keyboard are chicklets like the ZAGGfolio but are slightly thinner and apparently more responsive as I can type much faster on this keyboard. More on that later. This is not a portfolio case (though that is available) so ZAGG put magnets into the keyboard case’s trim to hold your iPad in place when you close it. I admit that I was hesitant at first to trust the magnets to hold my iPad in place but turns out that the magnets do their job quite well. They also turn off the screen when the iPad is in the closed position. When opened, the iPad sits at around a 60 degree angle (left my protractor at my high school) in both landscape and portrait orientations. Perhaps what matters most though is the headlining feature. This keyboard lights up. Anyone who has had a light up keyboard knows what a Godsend this feature is. Whether you’re typing at night, on an airplane or in the middle of a darkened lecture hall, being able to see the keyboard can make a world of a difference. Even if you have your home keys memorized, as I do, being able to look down and find the right symbol or feature key is brilliant. I’ve probably sold a dozen of these things on all of my flights around the country. On a Virgin America flight from New York City to San Francisco, my seat partner used his iPhone to buy one before we’d even taken off! In most of these cases it is the light up keys that sealed the deal. At first they are amazed at how fast I’m able to type on an iPad, confusing it for some tiny Apple laptop. Then I hit the light button and there is almost always an audible gasp. This is no hyperbole. I then proceed to cycle through all seven colors; white, red, yellow, green, aqua, blue and purple. You can also change the intensity three levels. The ZAGGkeys PROplus 7 mm thick vs the 23mm thickness of the ZAGGfolio. This is especially nice since the PROPlus fits in my new laptop + iPad bag where the old folio model does not. However, this thinness comes at a cost. The PROplus does not protect the back of your iPad. I’m not sure if the hardshell back of the iPad cases are compatible with the PROplus, but if they are, it might be a good idea to add that on. I have the ZAGG invisibleSHIELD protecting the back of my iPad but it wouldn’t save it from a drop like a hardshell back would, or the ZAGGfolio for that matter. Just like with the ZAGGfolio typing is a dream. This keyboard is large enough that I’m able to type nearly as comfortably and as quickly as I can with the Apple keyboards. While it isn’t quite as large as the standard Apple keyboard, it is large enough that your fingers don’t feel cramped. The only time things get a little congested is around the arrow keys, but I find this an issue with the compact Apple keyboards as well. 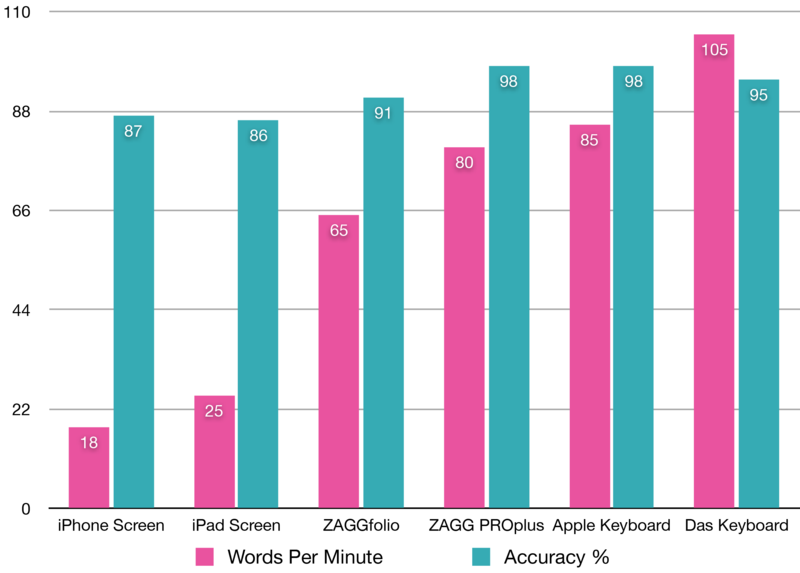 With the ZAGGkeys PROplus I was able to type significantly faster than with the ZAGGfolio keyboard. I’m not exactly sure how things are different enough to have this level of improvement but I won’t complain. If you need to get an email tapped out before your plane takes off, having a physical keyboard can absolutely make the difference in whether or not you get the job done. Since this is a Bluetooth iPad case, battery life is another important spec. I haven’t done any scientific measures of the battery life but here is one real-world measurement. The last time I charged my ZAGGkeys PROplus was the night before my flight to Saudi Arabia which was November 12, 2012. The battery did not die until yesterday, March 6, 2013. That adds up to three months and 23 days, or 115 days total. Just like the BOSE QuietComfort QC15 (review coming I promise), the ZAGGkeys PROplus battery life actually exceeds the promise from the manufacturer. There is a battery meter button on the bottom left of the keyboard to give you an estimate of how much life is remaining. In the end, if someone were to ask me which iPad keyboard they should get, the ZAGGkeys PROplus is absolutely the one I would recommend. It is thin, light, durable, fast and the keys light up. The only issue I have is that it doesn’t protect the back of your iPad so if you’re someone who throws their iPad around, maybe look at the ZAGGkeys PROfolio+ keyboard (ZAGG, let’s work on a standard for naming your products OK?). It has all the features of the PROplus but adds a back just like the ZAGGfolio. Like the ZAGGfolio I reviewed last year, this keyboard case has a back to it and holds the iPad in a single orientation so no portrait typing unless you want to remove it from the case which is a bit of a hassle. In exchange you get a case that provides better protection and a more professional look. It costs the same $129 as the ZAGGkeys PROplus but triples the thickness to 21mm. That’s 3mm thinner than the ZAGGfolio (I’m seriously exhausted from typing all these product names) if you’re counting the millimeters. 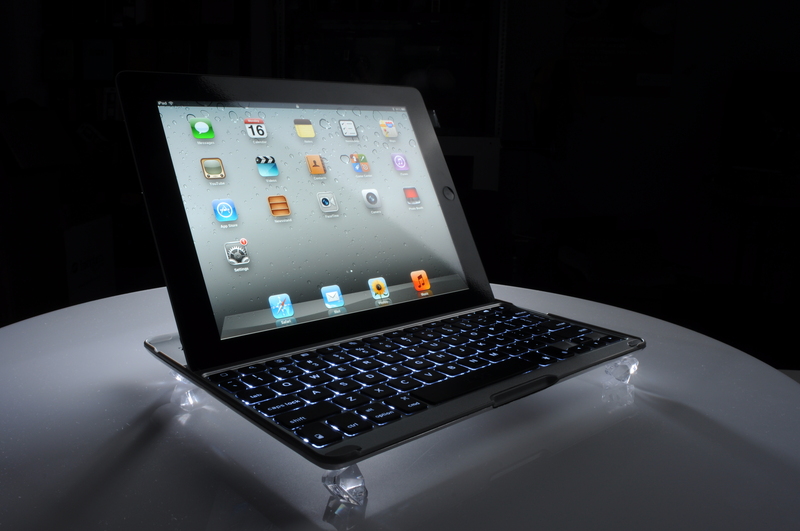 This entry was posted in Nerdiness, Review, Thoughts, Video and tagged Apple, best bluetooth keyboard, best iPad case, Bluetooth, Dell Axim, Facebook, iPad, iPad accessories, iPad case, iPad keyboard, iPad keyboard case, light up keyboard, lighted iPad keyboard, Logitech tablet keyboard, USB, Zagg, ZAGGfolio by Justin Scott. Bookmark the permalink. ZAGGdaily thanks for sharing the review! justex07 Thanks! I had not seen that. makfan the light up keyboard is awesome. justex07 ZAGGdaily yea remember that post now. I was thinking of how you use it vertically though with this keyboard? Take it out I guess? justex07 it’s a gift so I might end up buying him 2 cases to get his opinion on keyboard or not. tdankmyer for ages I used the ZAGGkeys ProPlus with the InvisibleShield on the back, totally scratch and dent free after 500,000 miles! tdankmyer plus it was way thinner than a folio and allowed for dual positioning. Light up keys were killer on my long overnight flights. justex07 yea, the folio’s main drawback is that it has to be in landscape mode.